This is a wondrous and colorful cluster of quartz from Messina, South Africa. The famous copper mines there have been closed down for some time and all of the original quartz mined was becoming rare. New finds have opened up temporarily (all have now closed) and the quartz is nothing short of magnificent … and it’s not all about ajoite. She is a gorgeous DT starburst cluster, 4.2 oz and 3.3” by 2.5” by 1.9”. 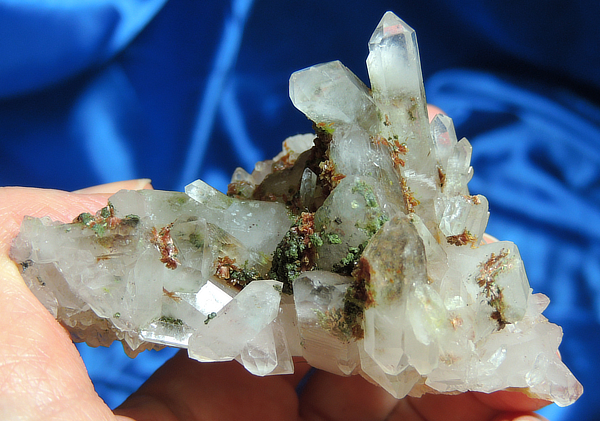 Her crystals are somewhat chaotic with areas of beautiful piedmontite (red) and epidote (green) crystals resting in the crevices! But look at those crystals like a wondrous flower, blowing in the wind! I love this combination as it is both grounding and heart-centered with gentle and soothing energies. She is a stunning beauty in both physical appearance and energy … ajoite or not, it is clear – this is a new Messina energy and it’s not all about the ajoite, but in this one, prepare your Self! These are sacred, sacred crystals, the Jewels of Lemuria … and ready for your small altar spaces! There are a few very tiny dings, but nothing that alters her energy or exquisite beauty! This cluster combines the one-ness of its blend of both red and green epidote to balance and align the core as well as the heart. This is a magical, magical combination … the balance is sublime and set in this already Spiritual host quartz from Messina, well … it is beyond sublime! This is a wonderful Spirit for those trying to assimilate the vast array of sensitivities and energies they are experiencing, freeing up the physical expression and putting the energy movement where it belongs … in addition, there is a new Lemurian awakening in this time and some feel that 2012 will ushered in the New Age of Lemuria. New Lemurian crystals are appearing from every corner of the world and from areas traditionally not thought to spawn Lemurian crystals. When I got the channeling for the Blue Tara Lemurians, I was told that the Lemurians knew of the pending destruction of their island and then encourage their people to spread to all points on Earth, together with the ‘Lemurian seed’ crystals so that at the proper time, the knowledge could be awakened. As I opened these special crystals, the hair was literally standing on the back of my neck … it was an experience I’ll never forget as I felt I was entrusted with the most sacred crystal ever to see the sun’s first light. I sobbed, I processed, I admired, I savored each one and know that one by one, they will go to a special Keeper who will be part of the Lemurian Awakening. This is an important Spirit for one who would be among the valiant and stalwart Keepers of these Jewels of Lemuria!